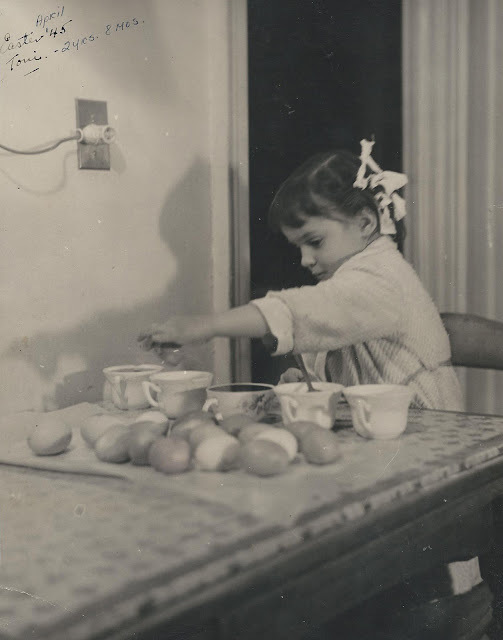 My grandfather took this photo of my mother in 1945. She was at 2 years and 8 months old, dyeing Easter eggs at their kitchen table in the Bronx. Look at that concentration. To this day she has that look on her face when she's creating something. I love her little chenille bathrobe and the rag curlers in her hair. Appears to me that she had rags tied in her hair to make curls....If so, I remember that move vividly than dying the eggs. Must admit though, the rags did the trick to make curls. Ooops...didn't notice that you had commented on the rags.